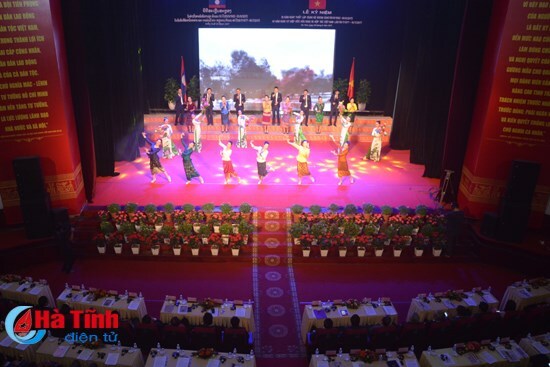 Ha Tinh (VNA) – A ceremony was held in the central province of Ha Tinh on August 30 to mark the 55th anniversary of Vietnam-Laos diplomatic relations and the 40 years of the Vietnam-Laos Treaty of Amity and Cooperation. Addressing the event, Secretary of the Ha Tinh Party Committee Le Dinh Son reviewed the special traditional relations between the two countries and the achievements that Ha Tinh has made to boost the bilateral ties. Ha Tinh borders the Lao provinces of Khammouane and Bolikhamsai, with its Cau Treo international border gate being one of the eight key national border gates. Over the past years, Ha Tinh has shared fruitful cooperation with the two provinces as well as Vientiane and other Lao localities in all fields, especially in education. Currently, more than 2,500 officials and students from 17 localities of Laos are studying in Ha Tinh. At the same time, Ha Tinh has also provided financial support to the Lao side to build education, health care and irrigation works. Authorised agencies of the two sides have also worked closely in ensuring security and social order along the border. Many Ha Tinh firms are also operating effectively in Laos, contributing to the socio-economic development in the country, while Ha Tinh is also hosting some Lao businesses. Kongkeo Saysongkham, member of the Lao People’s Revolutionary Party’s Central Committee, Secretary of Bolikhamsai Party Committee and Governor, said that the Laos-Vietnam sound relationship is the driving force of the two countries’ strength, greatly contributing to creating a peaceful, cooperative and friendly environment in Southeast Asia.